Contact Us – Free Estimate! 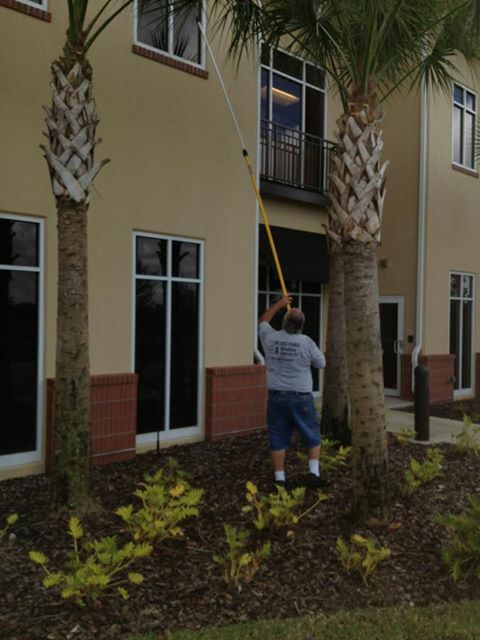 Providing Professional Residential & Commercial Window Cleaning in Orlando, Seminole, Lake, Osceola, Orange, Volusia counties. Whether it is your place of business or your home, windows are the first thing people notice. Neglecting your windows can result in stains and corrosion which can result in permanent damage. Regularly cleaning your windows can extend their life by preventing corrosion and staining and will improve the look of your home! Some of our frequent clients include homeowners, restaurants, retail stores, office building, car dealerships, and schools. We welcome large and small jobs. We have been in the window cleaning business for over 30 years and are a family run business. We take pride in the work we do, offer prompt and courteous service, and work hard for our customers. We work with our customers to ensure the most efficient and cost-effective way to maintain their windows. Our company is committed to excellent service and we offer a 100% Satisfaction Guarantee! Clean windows makes a statement! If you own a restaurant and are not having your windows serviced, more people will notice they’re dirty than if they are clean. Now they’re wondering what your kitchen looks like. SeeThru Window Cleaning Inc. Has been cleaning windows for 30 years. We can help you schedule your service to your needs. We are prompt professionals! Call 407-951-6405 for your free estimate.